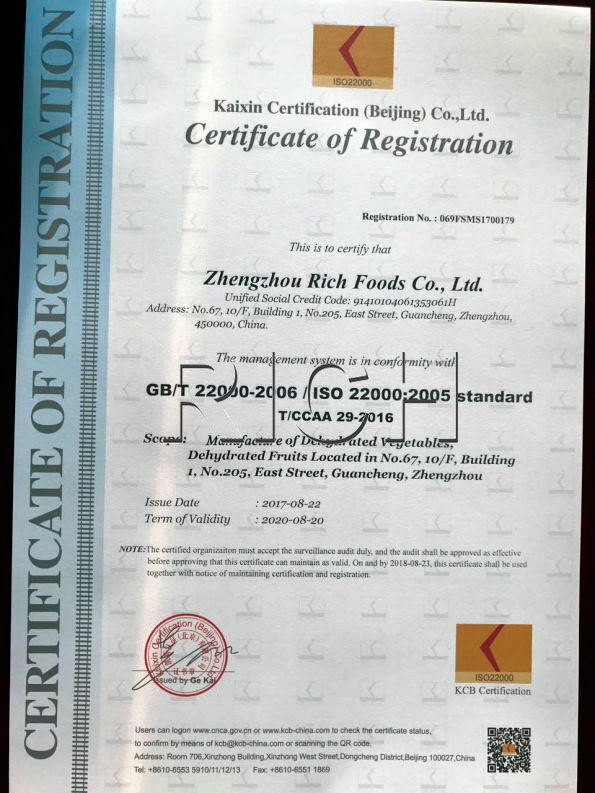 Zhengzhou Rich Foods Co., LTD, founded in 2006, is one of the biggest producers and suppliers of dehydrated fruits& vegetables. 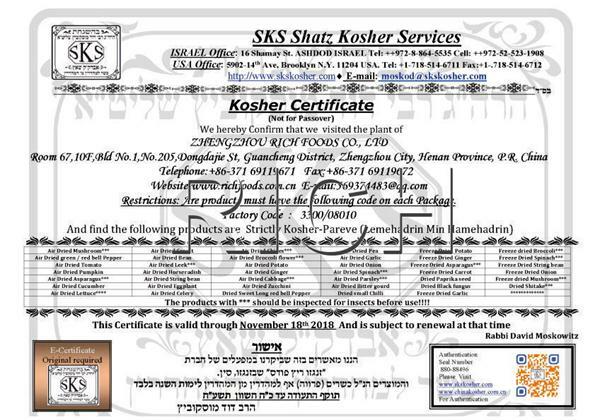 Zhengzhou Rich Foods Co.,Ltd.,located in Zhengzhou,Henan province, which established in 2006, specialized in producing and selling a varitey of agricultural products, such as dried vegetables and seasonings. Rich Foods is a manufacturer and supplier with the capabilities for maufacturing,trading and providing technical support. 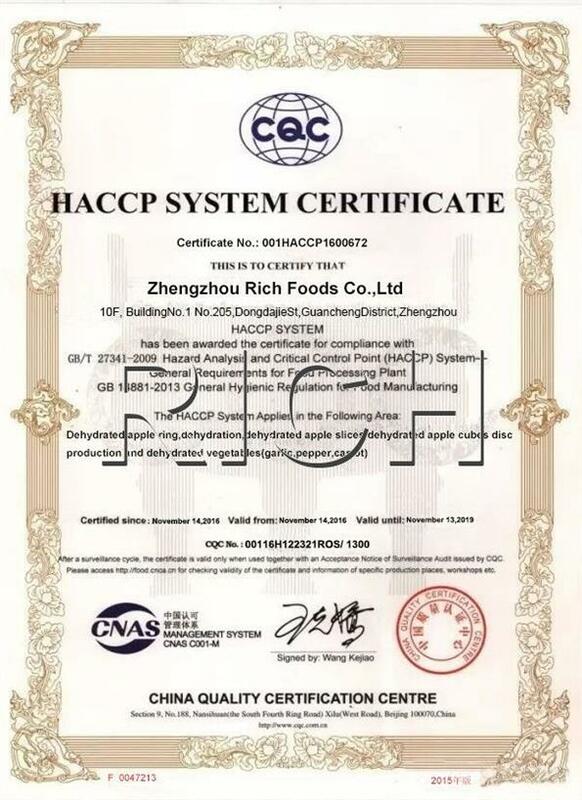 Nearly 15 years, Rich has been working to produce safe and healthy dried vegetables, fruits and so on,which have been widely used in meat processing,dairy industry, restuarant,super market and some convenient stores. Our products include dried & freeze dried vegetables, fruits, such as Garlic flakes/granules/powder, Carrot granules,Onion flakes/granules, Red/Green bell pepper flakes, Tomato flakes etc. Over 40 items of different products. Rich also cooperate with the best local manufaturers and suppliers from different countries to produce distinctive food for each customer and market. Making Rich products available all over the world is the objective we are working for. To ensure health and safety of customers, Rich manages the whole production line based on ISO9001 and HACCP/ISO22000. Meanwhile, monitoring the entire process from raw material production to final products. Rich, as one of the most professional food manufacturers,always insist that quality is the key to producing high quality products and managing company. We are committed to provide customers with the best products ans services.